I started blogging years ago because I wanted to start a business from home on the cheap – you can read that story here. When I tell people that I blog however, they automatically assume that I have a technical background – that I must have worked with computers in some capacity in my previous life. My first career out of college was as an accountant. I worked in public accounting and earned my CPA certificate. Sure I used computers – but I didn’t program them. After our kids came along, my husband and I decided that I should become a stay at home mom to raise the kids and run the house. So for years I was the happy homemaker – until I started my first blog. Without any technical knowledge, I set out to learn all I could about blogging. The thing is, with blogging, you learn by doing. My blogging was sporadic for many years – kids and life, you know the drill. Because of my haphazard approach I kind of wrote it off as a viable business. After several years at home (and continuing my blogging in fits and spurts) I thought it was time to go back to work part time as an accountant. And you know what? I hated it. Well, “hated” may be too strong of a word. The work itself was as exciting as accounting can be. But the schedule was tough. When you stay home for many years, you get used to being the master of your time. So having to actually go to work for a set number of hours everyday was brutal for me. It was like trying to stable a wild horse. Summer was the worst because my kids were home on their own. I wasn’t making enough part time to hire a nanny or pay for expensive all day or sleep away summer camps – just so I could work. Economically, it actually made more sense for me to stay home. So, I decided to start my own business and became a professional organizer. I love helping people increase their productivity and get more done every day. But the thing was – throughout my whole path, I continued to blog. And then the aha! moment – why not blog about what I love? Organizing. That is where I am at today. First of all, it hurts my heart to see people struggling to make ends meet. Even if you work full time – a blog is something you can get started with in the evenings and on weekends. You don’t need special technical knowledge to start a blog, but you do need a willingness to learn. The start up costs are low – you can get cheap web hosting for as low as $3.95 per month for your first year from solid providers like Bluehost. Or spend a little more and get managed WordPress hosting from BigScoots – so you don’t have to deal with a lot of the technical hosting hassles. Don’t know what to write about? That’s ok – just think about what you do best – what is your secret or not so secret superpower? Share that knowledge on your blog. The important first step is to just get up and running. Give it a try, see if it is right for you. If you like it – take the next step. 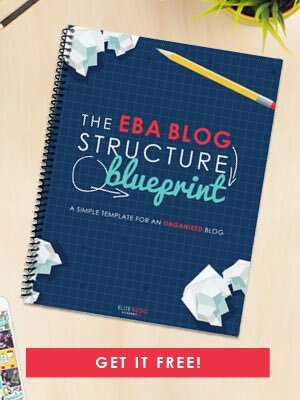 Enroll in a great blogging course to shortcut your way to an income. I took Elite Blog Academy, and I am so happy to have that guidance. You can make money from blogging if you are committed to it. Read about how these 5 bloggers are crushing it online. Most bloggers make money from these 5 income streams. Will it happen overnight? No. That is why the best time to start is when you don’t really have the time. Build your site up over time so that it is there for you when you are really ready to sink your teeth in. I am still at the beginning of my blogging path even though I started a long time ago because there is so much new to learn every day. Check out these FAQ's for Beginner Bloggers for more information.